Proprietary Name: Stomach Relief Ultra What is the Proprietary Name? Non-Proprietary Name: Bismuth Subsalicylate What is the Non-Proprietary Name? 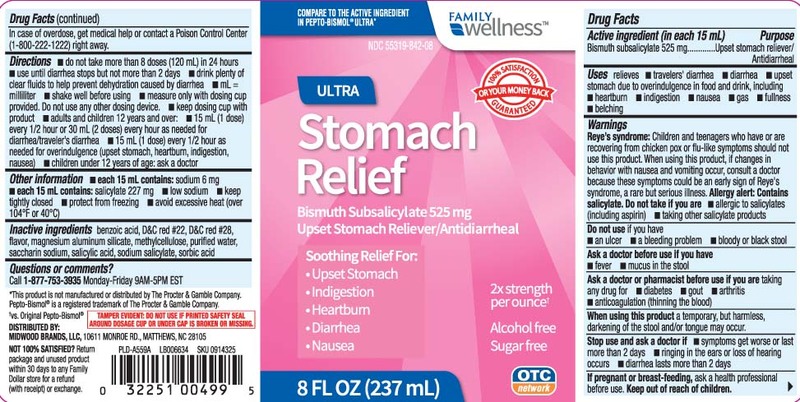 Stomach Relief Ultra with NDC 55319-842 is a a human over the counter drug product labeled by Family Dollar (family Wellness). The generic name of Stomach Relief Ultra is bismuth subsalicylate. The product's dosage form is liquid and is administered via oral form. FDA Application Number: part335 What is the FDA Application Number? In case of overdose, get medical help or contact a Posion Control Center (1-800-222-1222) right away.